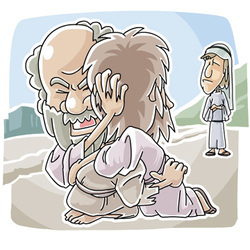 Jesus had been associating with known sinners and was being criticized by the scribes and Pharisees. Jesus told his critics three parables. The third parable: The younger of two sons want- ed to leave home. He asked his father to give him his inheritance in advance. His father agreed, and the son left. He ended up far from home and wasted all his inheritance on high living. When a famine hit, he was out of money and had to take a job feeding pigs. He was so hungry he would have been happy to eat the pigs’ food. Thinking about how well his father’s servants were cared for, he decided to go home and confess to his father that he’d sinned and ask to be made one of his father’s servants. So he set off for home. When he was still a long way off, his father saw him and ran to meet him. He put his arms around his son and kissed him. The son began his apology, but his father cut it off with his joy- ous welcome. The father instructed servants to bring the best robe for his son, a ring for his finger and shoes for his feet. He told them to prepare a celebration dinner. During the celebration, the older son returned. A servant told him about his brother’s return. The older brother was furious. His father came out to him, but the older son would not come in and welcome his brother home. He complained: He had always worked hard for his father, but he had never been given a party. But his brother, who wasted his money and brought shame to his father’s name, dared to come home and was reward- ed this way!